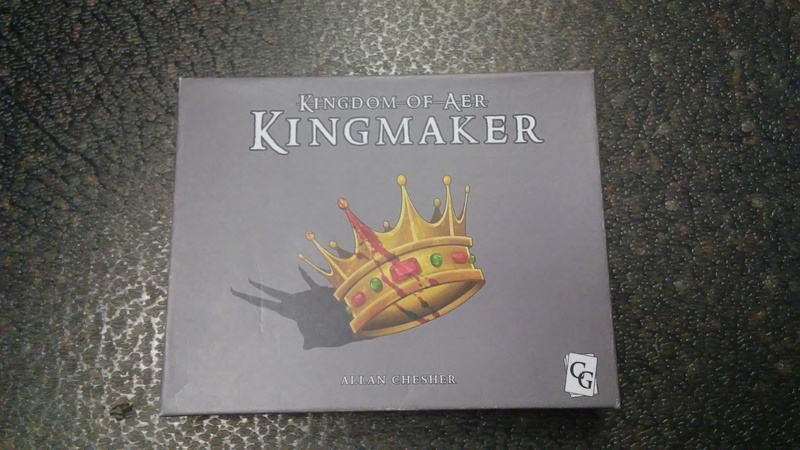 Kingdom of Aer: Kingmaker is a game by Allan Chesher, published by Centennial Games. It is for 3-5 players. In this game, players take on the role of nobles that are all vying for the newly vacated crown. They’ll be trying to eliminate their competition through treachery and even murder. In the end the player that can prove they’re the most worthy will be declared the winner. To begin, each player chooses a color and takes the corresponding deck of that color’s cards, becoming that noble house. 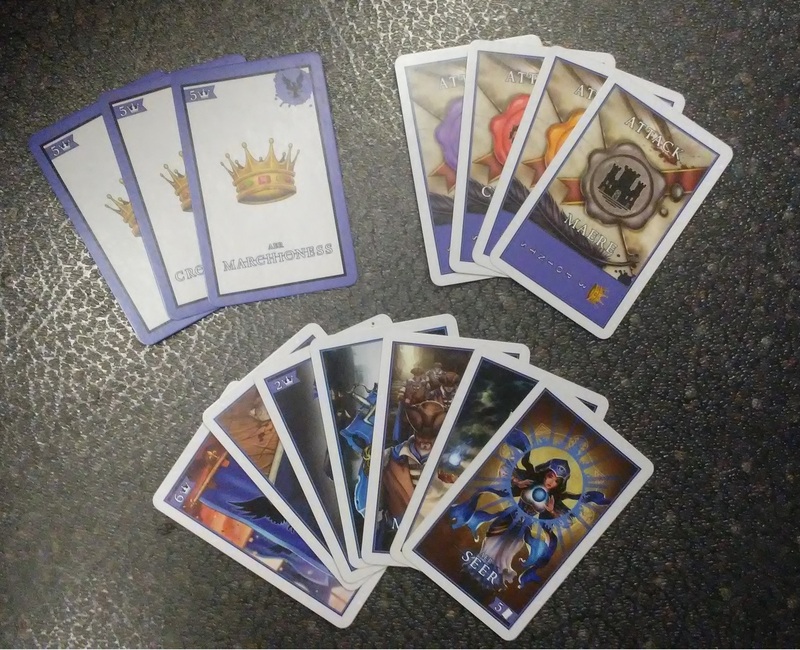 The players then place their 3 royalty cards face down in front of themself, while the remaining cards are placed in their hand. Once this is done, play now begins. The game is played over several rounds. Each round player’s will simultaneously choose a card from their hand and place it face down in front of themselves. Players are allowed to change their mind, picking up their card and replacing it with a different card, as long as there is still a player that hasn’t placed a card face down. Once all player’s have placed a card, the cards are “locked in” and can’t be changed. Players will now simultaneously flip over their chosen card and resolve the cards based on which cards are now revealed. This follows the 7 step order of resolution. First the Jester cards join the court, becoming an additional member of royalty that can be killed off instead of a royal. Next the Count attacks. That means that players check to see which house has the majority of attack nominations against it. If there is a tie, tied players are both hit. In the third step, the Seer removes attacks. This means that if the player that played the Seer has the most attack nominations, it can not be hit this round and instead the player with the next highest majority is hit instead. For the fourth step, the attacks now hit the appropriate player(s). In the fifth step, the Marshalls counter the hit. This means that if the Marshalls were played by the player being hit, the Marshalls will block the hit and counter attack with new hits being sent to all the players that played attack nominations against them. Once these steps are resolved, then the sixth step resolves. In this step the thief steals and the gold buys. What that means is that as long as there is at least 1 gold card played, then the thief is able to steal all the gold, discarding it and allowing the player to buy back one of their own character cards from the discard pile. If there are no thieves played, the players that played a gold card are allowed to buy back a character card from the discard pile. This does not mean that a royalty card that has been killed can be bought back. Those are special cards and not character cards. The final step is to add banners and the fanatic burns. This means that any player that played a banner is now able to add it to the top of their court of royals face up. This banner now allows attack nominations to count for 2 votes instead of just 1. If a player played the fanatic it burns all the banners that are on the table including the player that played it’s banner. It should be noted that attack nomination cards are returned to the player’s hand at the end of the round. Also, if a player contributed to killing the last royal of a player’s house, they earn a trophy. This means that the player places the attack nomination card for that house that they played under one of their own royals. This makes that particular royal worth more points at the end of the game. The game continues until there are only 2 houses remaining. That is to say that all but 2 player’s court of royals has been eliminated. The remaining 2 players now count up their points based on the cards they have on the table and in their hand. The player that has the most points is the winner. This game consists of 5 separate decks of cards representing the 5 different houses, as well as a couple of character reference cards. The cards are very nicely done and look really great. They’re pretty good quality and the artwork is really good. I really like the design and feel of the cards. The cards come packaged inside a small little box of cards that could fairly easily be tucked inside a pocket for ease of travel. About the only thing that I could ask for would be a divider inside the box to keep the stacks separate as they tend to get a bit mixed up. Thankfully it’s really easy to separate the decks thanks to the brightly colored backs of the cards. The reference cards are quite nice and they help remind players of not only what each character does but on the reverse side there’s a reminder of the order of resolution steps. Overall, I’m pleased with the cards and think everything looks very nice. The rulebook for this game is a tri-folded piece of cardstock. It’s colored and there are actually quite a lot of pictures on the rulebook. There’s pictures for setting up the game as well as how attack voting should look. On the back there’s a really good breakdown of each of the cards detailing how each one works. For a simple game I’d say that the rulebook does a decent job of explaining the rules. I do wish that things were a bit better explained especially when it comes to the order of resolution. Also I feel like it would be nice if there were rules for playing with only 2 players as well. Apart from that, I think that the rules aren’t that bad, especially since there are so many pictures and they’re all in color to boot. Overall it’s a pretty decent job. This is a pretty interesting little card game. I like the look and feel of the game. I like the simplicity of it as well. I even like the idea behind it, however the presentation is a bit lacking. The way the rules are set up causes the game to follow the path of player elimination until there are only 2 players left. Once there are only 2 players, then those players score their points and determine the winner based on point totals. For me I’d like it better if it was a set number of rounds of play and then points were totaled for everyone remaining, OR a straight up player elimination. Either of these would have been fine. The mixture of both makes the game feel a bit odd. Not that this makes the game bad in any way. I mean for a fairly simple card game, it has just enough meat to be enjoyable. As I’ve mentioned earlier, I do wish there were rules for playing the game with only 2 players. That would make things better for me. The rules state that the game is a 5 player game. However I’ve seen it noted as a 3-5 player game on the BGG and find that the rules work fine with less than 5. The game does tend takes a bit longer with more players, however it seems to add a bit more chaos and fun to it as well. Overall I’d be more inclined to recommend it for 4 or 5 players. 3 tends to end a bit too quickly. This is a game that fans of player elimination or take that style card games should enjoy. It’s a pretty nice game that I’d recommend giving a try especially if you like a simple and fast card game. Kingdom of Aer: Kingmaker is a light weight player elimination style card game with a take that feel. The game is fairly short with most game sessions lasting around 15 minutes or so. The cards are really nicely done. I especially like the great looking artwork on them. The rulebook is also quite nice as well. However I do wish that the order of resolution were a bit more detailed in the rules. I also would have liked rules for playing with 2 players but that would probably change the dynamics of the game and make it feel completely different. As it is, the game plays best for me with 4 or 5 players, even though the BGG lists it as being playable with 2 or 3 as well. I feel like it plays too short with fewer than 4 players. Therefore I recommend this game for 4 or more players. I will say that the mixture of player elimination and point scoring does feel a bit odd but it still kind of works. I would have liked it better as straight player elimination or point gathering style game but it is what it is. Fans of player elimination or possibly take that card games should enjoy this one. Overall, it’s a quick and simple card game that I’d recommend giving a try. You don’t even have to be royalty to enjoy it. For more information about this game and to get a copy for yourself, you can check out the Kickstarter campaign that’s going on right now. Simply follow the link below. You can also check out the website for the game below. This entry was posted in Reviews and tagged aer, allan, allan chesher, board, board games, card, card games, centennial, centennial games, chesher, games, kingdom, kingdom of aer, kingmaker. Bookmark the permalink.